I'm really looking forward to delivery of my New Forest High Mountain 2221 brushes. I have used this sample quite a lot now. 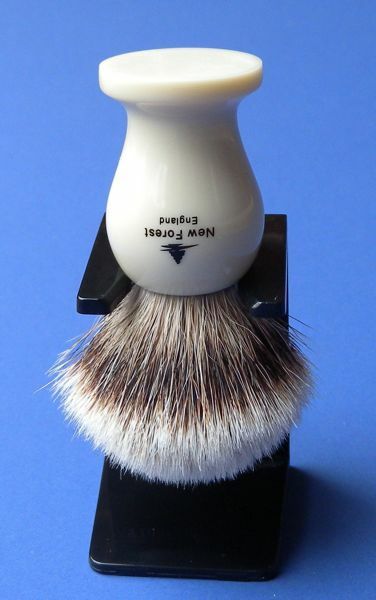 The new brush will have a slightly flatter head than this. These photos show something of how well the brush looks after regular use - and the whiteness of the brush tips. I am new to Wet shaving and loving it. I have your first 2 brushes that are bulb shaped and love them. What are the benefits of having a Fan shaped brush? Sorry the Feather razor didn't work for you. The flatter top of a fan shaped brush can make it even more comfortable on the face by spreading a larger area of brush over it. So although the 2221 will have a loft of only 47 mm it seems like a larger brush than you might expect compared with a bulb shape of the same size knot and loft. Lovely Peter! If all of them´ll look the same you could name them the "High Mountain White". The picture of it hanging upside down is exquisite and mouth watering! It's going to be High Mountain Badger - no accusations of plagiarism can then be made! Will you be selling these brushes? When will they be available? January 2010. I will announce the launch on this blog and on some shaving forums. Email me at NFB@padh.co.uk if you would like to be sent details shortly before the launch. These brushes are wonderful! Are they still available? and for what price? The New Forest 2221 are sold out. 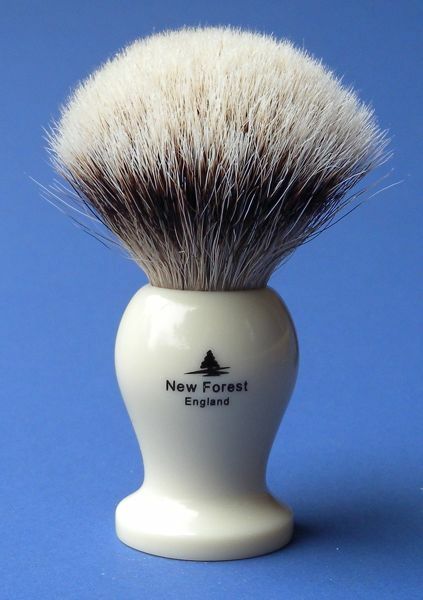 There will soon be some New Forest 2222 brushes. This will be High Mountain hair set in a different handle shape. Details will be posted on this site when they are available.